Hello everyone! So I'm back with another challenge! 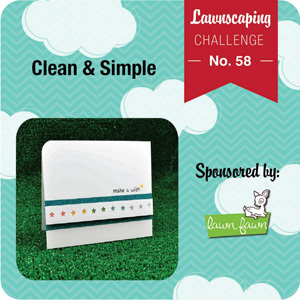 I just love challenges as they challenge me to use my stamps and try new things:) So today I made a card for the Lawnscaping Challenge No. 58 Clean and Simple. And boy was this a challenge for me. I made a card yesterday and it just did not come out CAS, so I gave it another go today and I like the way this one came out. I'm late with my card but I still thought I would share. I tried to keep it simple by not coloring anything but the penguins. And I was just flipping through my Lawn Fawn Sets and came across the Bon Voyage and Critters in the Snow sets and just thought of them flying and sitting among the clouds:) So that's what I did! I also added the "woo-hoo!" from Critters in the Forest Set to that flying penguin in the corner as he looks so happy! Then I added lots of clouds and stars from the Lawn Fawn Blue Skies Set. And the Believe in your dreams aentiment is from the Lawn Fawn Flutter By Stamp set. Thanks for looking! First DT project for Angie Delarie Stamps!